When stating the reason for a retake X-ray, be specific on the nature of the retake, for example: conecut, elongated, foreshortened, dark image, etc. The most commonly used X-ray machine is the wall-mounted dental X-ray unit (fig. 1-2). Because the basic components and operating techniques of all dental X-ray machines are similar, we will only discuss the wall-mounted unit. 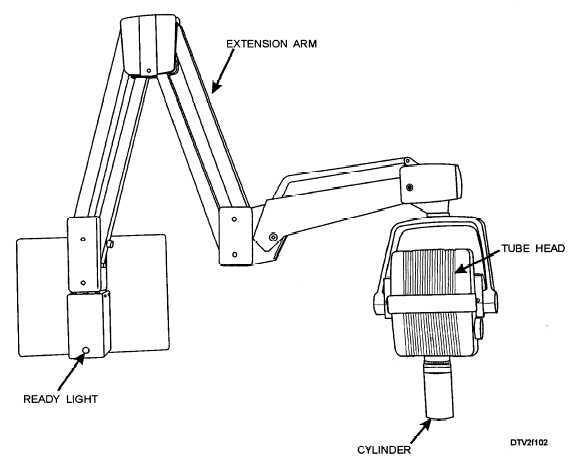 The component parts of the wall-mounted machine discussed here are the tube head, cylinder, extension arm, ready light, and a separate control panel. The tube head (fig. 1-3) contains the X-ray tube and other components necessary for generating X-rays. When an exposure is made, X-rays pass through an aluminum filter that screens out unnecessary radiation. Angulation scales are on both sides of the tube head for precise positioning technique. The cylinder (or cone) is affixed to the tube head and is used to align the tube head with the patient and the X-ray film. It is open-ended and composed of lead laminated material that establishes the minimum distance from the X-ray source to the patient's skin. Figure 1-2. - Wall-mounted X-ray machine.